Alberta Health Minister Sarah Hoffman, left, MLA David Shepherd, Moms Stop the Harm co-founder Petra Schulz, Dr. Kathryn Dong of the Royal Alexandra Hospital (RAH) and Edmonton Mayor Don Iveson open the RAH’s Supervised Consumption Service, the first hospital-based service of its kind in North America. Schulz holds a portrait of her son Danny, who died of an accidental Fentanyl overdose in 2014. 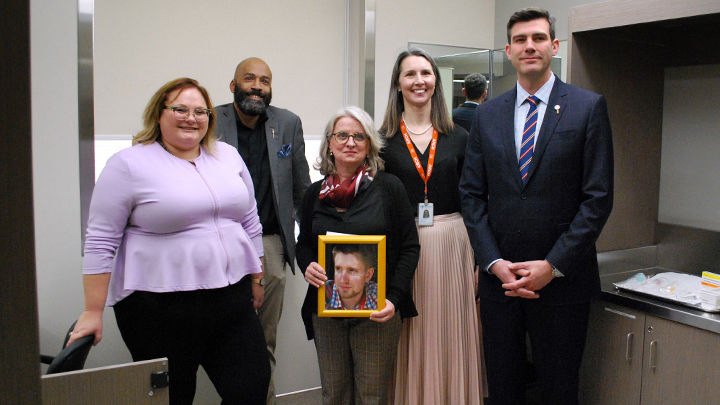 EDMONTON — North America’s first hospital-based supervised consumption service is now open at Alberta Health Services’ Royal Alexandra Hospital. It provides a place where people can use drugs in a monitored, hygienic environment to reduce harm from substance use. At the Royal Alex (RAH), hospital inpatients will benefit from the lifesaving supports offered, including access to treatment and mental-health supports. Health Canada provided final approval to open the supervised consumption services unit in mid-March, and the service launched April 2. The unit will be open for inpatients to visit 24 hours a day, seven days a week and can provide services for up to six patients at any given time. Nurses will be on hand to provide lifesaving services, including naloxone, in case of an overdose. Patients will continue to have access to their doctor, counsellors, social workers and peer-support workers for additional services, including mental-health supports, social work and opioid-dependency treatment. “Providing supervised consumption services for our inpatients ensures that individuals have access to evidence-based health interventions across the health-care spectrum,” says Dr. Kathryn Dong, director of the Addiction Recovery and Community Health (ARCH) program at the RAH. Evidence shows supervised consumption services save lives, reduce the transmission of infections by providing sterile needles and equipment, and enhance community safety by reducing public substance use and improperly discarded needles. “It’s important we do everything we can to support individuals and families affected by the opioid crisis,” says Sarah Hoffman, Minister of Health. AHS’ Sheldon M. Chumir Health Centre in Calgary began offering supervised consumption services for its community in late October. The site had almost 6,900 client visits up to the end of February, and reversed 119 overdoses during this period of time. Last year, 562 people in Alberta died of apparent fentanyl poisonings, including 135 people in Edmonton.